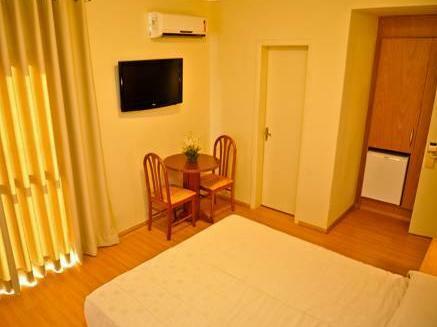 포스 두 이구아수 시내에 위치한 이 4성급 Rafain Centro Hotel은 카타라타스 대로(Cataratas Avenue)에서 단 2km 거리에 있습니다. 호텔은 에어컨이 완비된 현대적인 객실과 야외 수영장을 보유하고 있으며, 무료 Wi-Fi를 제공합니다. Hotel Rafain Centro의 우아한 객실은 케이블 TV와 미니바를 갖추고 있습니다. 객실은 세련되게 꾸며져 있으며, 전용 욕실에는 헤어드라이어와 기타 편의 용품이 구비되어 있습니다. 여행 정보가 풍부한 투어 데스크 직원이 이구아수 국립공원 투어를 안내해 드리며, 이곳에서 장엄한 폭포의 장관을 감상하거나 래프팅 및 생태 관광에 참여하실 수 있습니다. 매일 아침 각종 신선한 과일, 빵, 디저트로 구성된 조식 뷔페가 제공됩니다. 또한, 호텔 레스토랑에서는 빠져들 만큼 맛있는 현지 요리와 세계 각국의 요리를 즐기실 수 있습니다. 머무는 동안 피트니스실에서 활기차게 운동을 하거나 수영장 구역에서 친구들과 즐거운 시간을 보내실 수 있습니다. Please note that, the arrival shuttle from Foz do Iguaçu Airport to the hotel is free of charge but it needs to be requested in advance. The guest has to send to the hotel the details of the flight with 72 hours in advance of the check-in date.The return shuttle is not included. This service is not available for 1-night stay bookings. This hotel is located in the city center. So it would be good if you don't have car with you. 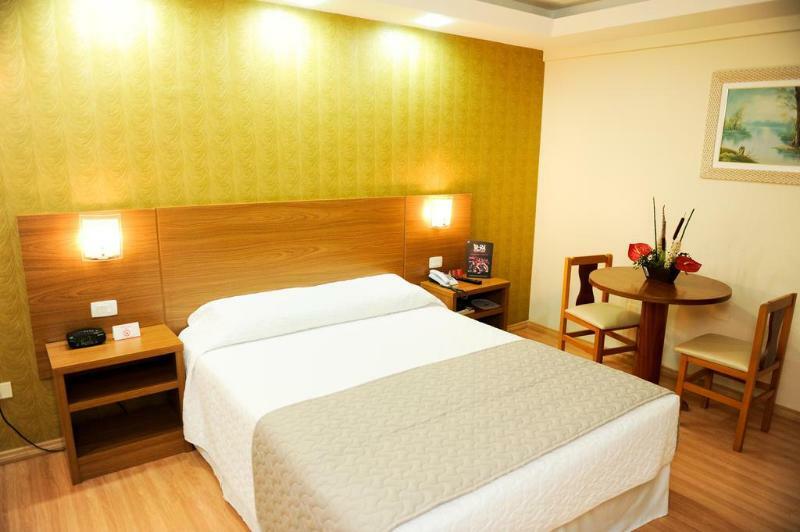 But the price is quite expensive compared to the other hotel. Room is also very very very small, nowhere to put luggage. Staff is helpful. Should you not have your car, this hotel is the right place to stay. By the way, city is queit, not much movement of people, nothing much to do during the day if you don't go to iguassu falls. 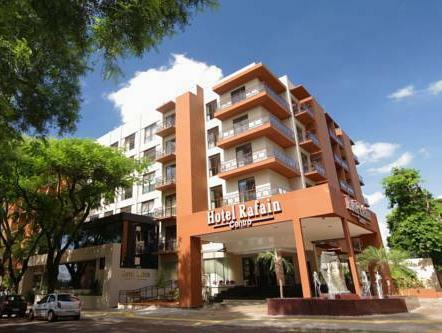 Das Hotel Rafain Centro liegt ziemlich im Zentrum von Iguazu. Restaurant, Banken und Bushaltestellen, Supermarkt etc. sind schnell erreichbar. Unser Zimmer gab keinen Anlass zur Beanstandung. Sauberkeit und Ausstattung völlig in Ordnung. Die Betten waren allerdings etwas hart gefedert. Uns hat das gute Frühstück mit seiner großen Auswahl sehr angesprochen. Der Service war gut und die Rezeption sehr freundlich und hilfsbereit. Wir haben mehrmals den Pool benutzt und waren sehr zufrieden. 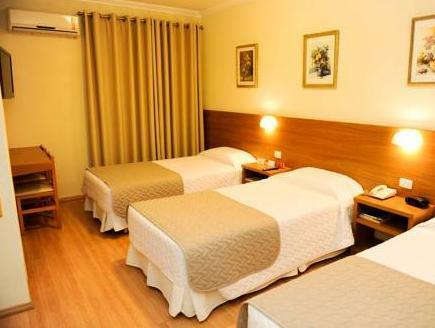 Embora a classificação do hotel ser de 4 estrelas, o hotel tem banheiro e quarto mal conservados. A conexão de internet não é muito rápida. Como pontos positivos destacam-se a localização, bom atendimento da equipe do hotel e um bom café da manhã.